Energy and Environment's Yong Wang has been elected to join the Washington State Academy of Sciences for his outstanding scientific achievement and leadership. Wang was honored in September at the Academy's annual meeting in Seattle, along with 23 additional new members. He was recognized for "groundbreaking research that ties fundamental kinetics studies of catalytic materials to the creative design and successful commercialization of novel microchannel reactors." The Washington State Academy of Sciences consists of 245 members, 13 of which are staff at PNNL. Academy members provide expert scientific and engineering analysis to inform public policy-making, and work to increase the role and visibility of science in Washington state. 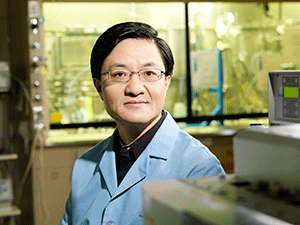 Wang is a Laboratory Fellow and the associate director of the Institute for Integrated Catalysis at PNNL. He also holds a joint appointment as the endowed Voiland Distinguished Professor in Chemical Engineering at Washington State University. Furthermore, Wang is a Fellow of the American Institute of Chemical Engineers, the American Chemical Society, the Royal Society of Chemistry, and the American Association for the Advancement of Science. To learn more, read the PNNL news release.